A few years ago we built a new second story deck on our house. It was a lot bigger than our existing deck and we sealed the deck so we could also use the space under our deck. This provided two new areas to enjoy our home especially during the spring, summer and fall. The lower deck gets used more in the winter and the rain days because I can use it for barbecuing. At some point we will install a hot tub and I’m sure we will use it a lot more. Enjoying a nice evening with friends outside and on the patio. (BPT) – If you’re like many homeowners, you consider the patio an extension of your home. So it’s fair to ask: Would you be just as comfortable nestled in with your favorite book or preparing a meal in your outdoor space as you would in your living room or your kitchen? As you contemplate ways to improve your outdoor area, think about projects that can both extend the hours you spend outside and make the time you spend there more relaxing. 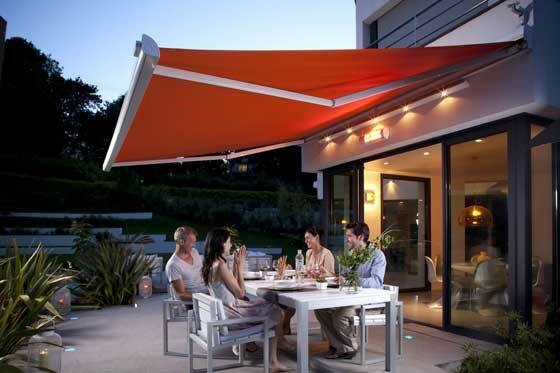 * Shade matters: Awnings and umbrellas also play a huge role in regulating the temperature and comfort of your deck or patio. And now, shading options have become more sophisticated and easier to maintain than ever before. You’ll never have to worry about damaged awnings on a windy day with Somfy’s motorized awning systems and wind sensors that work together to automatically retract your awnings when winds become too high.-Retractable awning systems powered by Somfy can also be accessorized with sun sensors that signal motorized awnings to open as soon as the sun rises, keeping your outdoor space cool from the start of the day.- If adding a hint of warmth is needed, simply install an awning heater – All of these accessories can be managed by the same remote that controls your motorized awning. With a system like this, you can leave the days of fiddling with fussy patio umbrellas behind. * Take look at your lighting: High-powered outdoor lights on sensors might be helpful when you’re bringing in the groceries at night, but patio entertaining calls for a little more subtlety when it comes to lighting. Consider zero-energy solar-powered fixtures around the perimeter of your patio for a gentle ambiance to light up your evenings. Somfy’s motorized systems can also be connected to your lighting, allowing you to adjust brightness as needed from the comfort of your patio lounger. If you have any tips or ideas on extending your house on to your patio or deck, please leave a comment below.